Del Mar is a quaint seaside village rich in history, striking natural beauty and European charm. 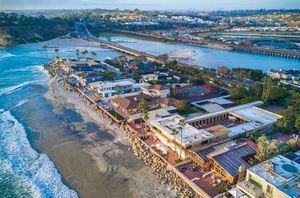 Located just 20 miles north of San Diego on the Southern California coastline, Del Mar Village is unique in its offering of a vibrant small-town atmosphere, sprawling natural playground along the Pacific Ocean and the casual sophistication of a world-class destinSave & Closeation. First renowned during the golden era of the movie industry, Del Mar was the retreat for Hollywood’s biggest movie stars who came to enjoy its peaceful ambiance, pristine beaches, and exhilarating thoroughbred horseracing. Today, the affluent and historic Del Mar Village attracts visitors from across the globe seeking breathtaking vistas, stunning sandstone canyons, beach activities and award-winning cuisine with spectacular ocean views. The collection of unique, independent shops, outdoor cafes and boutique hotels, many in half-timbered, Tudor-style buildings, is accessible on foot throughout the heart of the Village. Del Mar Village is also easily navigated on a bicycle and the beaches are dog-friendly. Del Mar is home to the renowned Del Mar Racetrack which brings the excitement of thoroughbred horseracing during racing season and the hugely popular San Diego County Fair which kicks off the start of summer. Nearby attractions include famed Torrey Pines Golf Course, home to the US Open and Farmers Insurance Open, the world-famous San Diego Zoo and Safari Park, Torrey Pines State Preserve and Legoland. Del Mar is a beach city in San Diego County, California. Del Mar is Spanish for "of the sea" or "by the sea," which reflects its location on the coast of the Pacific Ocean. The Del Mar Horse Races are hosted on the Del Mar racetrack every summer. The United States Navy operated a Naval Auxiliary Air Facility for blimps at Del Mar during World War II. The population was estimated at 4,311 in 2014, up from 4,161 at the 2010 census. Del Mar is Spanish for “of the sea” or “by the sea,” which reflects its location on the coast of the Pacific Ocean. The City of Del Mar was incorporated in 1959 and is the smallest incorporated city in San Diego County, with a population of 4,500 tucked into 2.1-square-miles. Del Mar’s climate is considered Mediterranean-subtropical with warm, dry summers and mild, humid winters. It is considered one of the most desirable climates in the United States. Temperatures rarely exceed 85 °F (29 °C) or drop below 41 °F (5 °C) throughout the year. The average yearly temperature in Del Mar is approximately 65 °F (18 °C). In the same year, Loop met a very successful rancher from New Mexico, Mr. Jacob Shell Taylor. Taylor and Loop were both captivated by the beauty of the area and recognized a development opportunity. In the summer of 1885, Taylor purchased 338.11 acres and began building the new resort town. Del Mar was named by Loop’s wife, Ella, who took it from a popular poem of the time titled “The Fight for Paso Del Mar.” Jacob Taylor initially built as many as 40 small houses, a two story Victorian schoolhouse, an observation tower, a train depot and a water system. Additionally, in 1886 Taylor opened “Casa Del Mar,” the area’s first resort. Del Mar became a popular vacation destination. For five years, the town bustled with development. Sadly in 1889 Jacob Taylor woke up in the early morning to the smell of smoke in his hotel room. He woke the hotel guests, guaranteeing their safety, but within two hours the entire hotel burned to the ground. Taylor insisted he would rebuild the hotel but, unfortunately, he never finished it. Taylor moved to Texas; leaving behind the town he founded, never to return. On March 9, 1909, the beautiful Stratford Inn opened for business. It was a world-class hotel built on 10 acres. It quickly became the desired destination for Hollywood’s silent film stars. Shortly after the hotel was finished, a pier (which was washed away in a storm years later) and a new train depot were built. The train depot was directly in front of the hotel, making it an easy commute. The same depot sits on the location today. During the 20′s and 30′s Del Mar experienced tremendous growth. During the early 30′s the San Diego Fair was looking for a permanent home. Col. Ed Fletcher of the South Coast Land Company suggested the 184-acre site in the San Dieguito Valley just north of the Village. The Works Progress Administration provided the initial funding and the Del Mar Fair opened to great fanfare in 1936, a yearly tradition that continues. A year after the Fair opened the mile-long oval thoroughbred racetrack was completed. During World War II the races came to a halt so that the facilities could be used as a bomber tail assembly plant. However, racing returned in August 1945 after Japan surrendered.